A meteor is the fireball that occurs when a space rock (called a meteoroid) burns during its entry into the Earth’s atmosphere. For this reason, every space rock that falls naturally to Earth inevitably becomes a meteor, be it of greater or lesser intensity. This concept serves as a starting point for the following list. But it happens that sometimes an alien rock falls to Earth, becomes a meteor, and then, for some reason, decides to leave our atmosphere to continue its journey through space. Below, we will see ten examples of meteors that exhibited this behavior, some of which even became awe-inspiring spectacles. An Earth-grazer event occurred in Japan on March 29, 2006. A bright fireball crossed the sky over several Japanese cities, allowing several stations to accurately measure its trajectory and characteristics. The cause of the fireball was a meteoroid of approximately 100 kilograms (220 lb) that entered the atmosphere at a height of 87 kilometers (54 mi). From there, the meteor traveled about 1,000 kilometers (621 mi) over Japan, lasting 35 seconds before leaving Earth. This was the third Earth-grazing meteor scientifically observed and measured accurately. Photographs, recordings by TV cameras, telescopic observations, and a special software were used to determine its characteristics. Even with all this equipment available, there are very few documented cases of Earth-grazers around the world, although most of the items on this list fit the category. On October 13, 1990, two astronomical stations detected the passage of an Earth-grazer meteor over Czechoslovakia and Poland. Three other independent observers in Czechoslovakia and a fourth person in Denmark also confirmed the sighting. The fireball was caused by a 44-kilogram (97 lb) meteoroid, which descended into the Earth’s atmosphere to a minimum height of 98 kilometers (61 mi). It was moving at a speed of around 42 kilometers per second (26 miles per second), about 20 times faster than the fastest manned aircraft in the world. For the nearly ten seconds it was visible in the night sky, the Earth-grazer traveled a distance of 409 kilometers (254 mi). After that, the meteor left the atmosphere and returned to space, now with a reduced speed. Its mass was also reduced; after burning a little in the atmosphere, it lost 350 grams (0.77 lb) of material. To verify the object’s trajectory, NASA ran computer simulations, whose results were similar to direct observations and confirmed that the meteor left the Earth. A Czech camera station that is part of the “European Fireball Network” program photographed the Earth-grazer in mid-flight. The image shows the bright object moving across the visible sky near its highest point. On some occasions, an Earth-grazer meteor can fall low enough into the atmosphere to end up breaking into pieces. When that happens, the Earth-grazer becomes multiple, smaller fireballs that travel horizontally across the sky in the same direction. Some fragments disintegrate in the atmosphere, while others return to space. Because the lights move in a seemingly organized way and at a lower speed, this phenomenon is known as a “meteor procession.” This type of Earth-grazer is even stranger, with only four known cases to date. One of these cases occurred on July 20, 1860. It was 9:49 PM when the American painter Frederic Church and his wife (who were on their honeymoon in Catskill, New York) saw a row of bright orange meteors that crossed the entire sky. Not far from there, the famous writer Walt Whitman also saw the same lights. In his poem “Year of Meteors (1859–60),” he described them as “the strange huge meteor-procession dazzling and clear shooting over our heads.” Hundreds of people across the United States witnessed the fireballs, and numerous newspapers of the time also described the event. What all these people saw was a rare meteor procession involving several meteors that crossed the North American sky from west to east. The fragmented Earth-grazer descended on the Great Lakes between the United States and Canada, reached its minimum height above the Hudson River in New York, and continued moving toward the Atlantic Ocean. After a journey of more than 1,600 kilometers (994 mi), the meteors escaped the atmosphere and left Earth behind. 20,000 years ago, a large comet in our solar system shattered and gave birth to Comet Encke (officially called 2P/Encke), famous for approaching Earth frequently. On June 10, 2012, a meteoroid from this comet came to visit our planet and then resumed its journey through space. The rock weighed 16 kilograms (35 lb) and entered our atmosphere about 100 kilometers (62 mi) above the east of Spain. The Earth-grazer moved at an astounding speed of 105,000 kilometers per hour (65,244 mph) while advancing toward the southwest of the Iberian Peninsula. After descending to around 98 kilometers (61 mi) above sea level, the meteor began to regain altitude. While still being over Spain and 32 kilometers (20 mi) away from the Atlantic Ocean, the fireball said goodbye to us and went into space again, with only a minimal change of speed. However, our planet did leave marks on it. The scorched meteoroid lost 260 grams (0.57 lb) in the atmosphere and returned to its orbit with a fusion crust, the external layer of melted rock typical of meteorites. In total, the fireball traveled 510 kilometers (317 mi) in the atmosphere for 17 seconds. This former meteor has several particular characteristics that differentiate it from the rest. On the one hand, it is the faintest Earth-grazer meteor scientifically observed, with a brightness similar to that of the planet Venus. And in addition, it is the first of such events that comes from a meteor shower. It came specifically from the Zeta Perseid meteor shower that occurs in June each year, which, in turn, comes from the same space debris field as Comet Encke. On the night of December 24, 2014, while everyone was busy on Christmas Eve, a meteor decided to come to Earth to observe us. Then, for some reason, it left. A total of 13 observation stations in Spain and Portugal detected an Earth-grazing fireball moving slowly—for a meteor—from southeast to northwest over Europe. The object was a rock of 100 kilograms (220 lb) and 1 meter (3.3 ft) in diameter, flying at a speed of 68,400 kilometers per hour (42,500 mph). The meteor entered the atmosphere over North Africa, beginning to glow 105 kilometers (65 mi) high. Then, the Earth-grazer continued to move and descend down to a height of 75 kilometers (47 mi) over Spain. There, the fireball was moving so slowly that some drivers had time to park to get out and see it pass. The meteor continued its journey, now over Portugal, as it began to ascend again. Finally, the Earth-grazer reached the Atlantic Ocean, and about 100 kilometers (62 mi) away from the coast of Galicia (Spain), it returned to space. The meteoroid, whose code name is SPMN241214, is a rock that came from the main asteroid belt between Mars and Jupiter. After its close encounter with the Earth, the rock had its trajectory modified, although it still orbits around the Sun as before. Footage from the University of Huelva shows that the object was very bright, leaving a short and thin trail behind. Another recording from the Spanish province of Guadalajara (shown above) reaffirms the slowness of the meteor. Although in this video, the light lasts about half a minute before leaving the camera’s field of view, the total duration of the fireball was one minute. Not all shooting stars return to space on their own. Some rocks that were once meteors have flown back into outer space thanks to human intervention. In October 1962, a farmer was working in his fields in Zagami, Nigeria, when he suddenly heard a loud explosion. When he looked up at the sky, he saw a meteor fall and hit the ground only 3 meters (10 ft) away from him. The farmer noticed that now there was a crater 0.6 meters (2 ft) deep, with a black rock inside. This rock was nothing less than an 18-kilogram (40 lb) meteorite from Mars. The rock was ejected from the Martian surface after a comet impact 2.5 million years ago. In November 1996, NASA began its first successful mission to the Red Planet after two decades—the Mars Global Surveyor. This mission consisted of launching a spacecraft destined to orbit Mars and photograph its surface for several years. But it turns out that the space probe did not fly alone: Inside, it was carrying a small piece of the Zagami meteorite, covered by a resin bubble. In September 1997, the NASA spacecraft began its orbit around Mars, thus returning the Zagami meteorite to where it belongs. That’s right, the rock left Mars millions of years ago, fell to us like a shooting star almost 60 years ago, and then finally returned to its home planet. Although Mars Global Surveyor is currently inactive, it is still orbiting our neighboring planet and is expected to collide with the Martian surface in the future. So the Zagami meteorite will become a meteor for the second time, now in its own world. Meteors are so brief and unpredictable that it is difficult to determine where the next one will occur. And it is even more difficult to know if some particular sightings really were meteors that fell and returned to space. 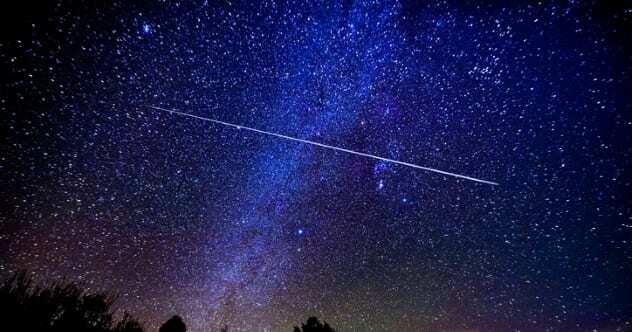 On October 3, 1996, an unusual shooting star crossed the night sky of New Mexico, after which it vanished. But 100 minutes later, the same fireball flew over California and exploded. It is believed that the meteor was a rock that bounced in the atmosphere and almost completed a full orbit before falling back over Southern California. However, the reports remain unconfirmed. Meanwhile, at 11:00 PM on September 21, 2012, thousands of people across England, Scotland, and Ireland witnessed a fireball (shown above) flying through the skies. The light moved slowly and lasted about 40 seconds before disappearing. Two and a half hours later, another shooting star with the same characteristics crossed the sky over Canada and the United States. In several countries, the emergency lines were saturated with hundreds of phone calls from people frightened by the fireball they had just seen. Soon, mathematician Esko Lyytinen, a member of the Ursa Astronomical Association (Finland), entered the scene and stated that the meteors of September 21 were related. Both were the result of a single space rock that began to burn in the sky over Ireland at a height of 53 kilometers (33 mi) but had enough speed to fly back into space. However, that entry into the atmosphere caused the rock to lose speed. So, 155 minutes and a full orbit around the Earth later, the remnants of the meteoroid reentered the atmosphere over North America and ended their crazy flight there. With limited information about the speed and angle of the meteors, some experts doubted this claim, but the possibility of a new Earth-grazer is still there. Information about the following Earth-grazer meteor, called EN070807, is scarce. All available references to it come from a single public access article from the Ondrejov Observatory, which is part of the European Fireball Network in the Czech Republic. Since the European Fireball Network names meteoric events with an abbreviation of the date they occurred, the code name of this Earth-grazer indicates that it visited Earth on August 7, 2007. EN070807 is actually an Aten-type asteroid. Aten asteroids are rocky fragments that orbit the Sun at short distances, and it is believed that most of them come from the main asteroid belt. Many Aten asteroids occasionally intersect Earth’s orbit, which makes them a possible danger to our planet. In the case of EN070807, although its initial orbit was of the Aten type, its encounter with the Earth could have changed its trajectory. While EN070807 was descending over the European sky, several stations in the Czech Republic photographed the event. This allowed the European Fireball Network to include the Earth-grazer in the aforementioned biannual report, along with 44 other conventional fireballs. Like the other meteors on this list, EN070807 lost material during its brief passage through the Earth’s atmosphere, but the rest of its body is still floating out there. The Zagami meteorite is not the only alien rock that humans have sent back to space. For 4.5 billion years, a large iron body roamed outer space until it collided with Earth 4,000 years ago. The meteorite fell in Argentina, and locals call the impact zone “Campo del Cielo” (Field of the Sky). In 2012, Scottish artist Katie Paterson acquired a small meteorite from Campo del Cielo, melted it at 1,700 degrees Celsius (3,092 °F), and reshaped it to its original form. The old-new meteorite, weighing 680 grams (1.5 lb), was then transferred to a European Space Agency facility in the Netherlands. And in July 2014, it was launched to the International Space Station, aboard the spacecraft Georges Lemaitre. The meteorite was unpacked and prepared for its return to Earth in the same spacecraft that took it up there. Finally, in February 2015, the meteorite had a destructive reentry into the Earth’s atmosphere. So it differs from the Zagami meteorite in at least two things. First, the Campo del Cielo meteorite was a meteor twice. And second, it was a meteor twice in our own atmosphere. This is why Paterson’s work was internationally recognized, and it proved that a meteor which falls to Earth does not have to do it only once. While all the other Earth-grazing meteors we have seen on this list occurred at night or under poorly studied conditions, the following case occurred in broad daylight and in front of thousands of people. For this reason, it is the best-known Earth-grazer, and it is widely remembered as the Great Daylight Fireball. It was 2:30 PM on August 10, 1972, when a space rock entered the atmosphere above the state of Utah. And for more than a minute and a half, it crossed the sky in a northward direction. The meteor ended up leaving Earth over Alberta (Canada). The Earth-grazer generated enough heat during its passage through the atmosphere for a US Air Force satellite to be able to detect it, obtaining data on its speed and trajectory. After several investigations, it was determined that the object entered our planet at a speed of approximately 54,100 kilometers per hour (33,616 mph). The meteoroid would have had a maximum mass of 570 tons and a length of 14 meters (46 ft)—roughly the size of a truck (but much heavier). When the object escaped the atmosphere at a height of approximately 102 kilometers (63 mi), its size became 10 meters (33 ft) at the most. Its closest approach to the Earth’s surface occurred 58 kilometers (36 mi) above Montana. Due to its low altitude, people near the site could hear sonic booms coming from the meteor in the sky. There are multiple recordings of the fireball, such as a 20-second video showing its path or a photograph in which the Earth-grazer flies over the Teton Mountains in the state of Wyoming. Now, we all know the outcome of this story, but it is estimated that if the object had impacted the Earth, it would have had the destructive force of an atomic bomb. So we can thank the meteor for being in a good mood that day.